General Martinez looked at Professor Alison Watkins with suspicion. The military commander was aware that she was the most gifted scientist the Advanced Weaponry and Tactics unit had ever produced, but there was something about her that made him uneasy. She had pioneered the research that had created the Echoes, the almost-human front line troops used by the Humanist Rebellion and, for this, the General had the greatest respect for her. However, the more time he spent in her company, discussing the efficacy of the units in combat field tests and suggesting small iterations to improve their performance, the more he thought that the enigmatic scientist may be as coldly indifferent as her creations. A veteran of countless battles over the last two decades, Martinez had witnessed carnage of the worst kind and was rarely moved by such sights, but there was something about the Echoes that got under his skin. Witnessing one calmly walking up to a fallen enemy and executing it without the faintest glimmer of emotion still jarred. The General had for many years been a front line troop himself and had killed countless foes, but even he felt a tightening of his face and chest when taking a life at close range. Not so the Echoes; they did not kill through a shared responsibility to further the cause of the Humanist Rebellion, or through a sense of duty or drilled-in obedience to the chain of command. No – they were simply programmed to kill. Initially the first few prototype units were nothing more than metal skeletons, but the human soldiers that took part in the first few field tests found them to be unnerving, and several experienced psychological episodes as a result. In response, Professor Watkins and her team produced a flesh-like gel coating covered in artificial skin to sit on top of this skeleton, helping her creations to look more human and better integrate with the Rebellion’s regular soldiers. Even so, they had found it difficult fighting alongside the Echoes when they looked physically identical to them but could not share in the same camaraderie post-combat. Martinez reported back to Watkins that a few subtle changes would be needed; something that made the Echoes look slightly less human. Professor Watkins pressed her lips into a thin frown, and began to sketch some adjustments on her tablet. Less variation, each unit’s bar code made more visible to help identify them, more angular features (Watkins remarked that this would save time spent ‘smoothing’ the Echoes’ appearance). Finally she showed the design to Martinez, and the General nodded in agreement; perhaps this would help his men treat them more like weapons rather than fellow soldiers. As he returned to the barracks, he couldn’t help but wonder what terrible consequences might be brought about in the name of protecting human life. Echoes are currently mankind’s greatest advancement in Artificial Intelligence (AI), made possible through the twin technologies of cybernetics and Whole Brain Emulation (WBE). They are mostly human in outward appearance but have been engineered in a number of key ways. They have not been built to approximate humans perfectly, more they have been built to approximate the perfect human soldier. Many people regard Echoes with suspicion, especially those within the Children of the One True God, who consider Echoes to be inhuman avatars of godlessness, the apex of humanity’s arrogance. Echoes have a skeleton built of a lightweight and super-strong lattice polymer covered in a bio-farmed skin material that is much tougher than the human equivalent, effectively enabling them to use their bodies as weapons. They have the ability to heal themselves of serious injuries and, in certain circumstances, can shut down extraneous functions in order to fire off an extra shot or two. Echoes are fully autonomous and have had their brains programmed specifically to be as efficient as possible in combat situations. They lack the capacity to ‘learn’ beyond battle tactics and they neither feel nor exhibit emotion, a ‘good kill’ simply being their prime objective. They carry pulse rifles – more advanced versions of the UNM Modular Assault Rifle – for long range combat. In close combat, they have no need for weapons, as their speed, lack of fear and increased physical toughness enables them to perform martial art attacks directly on their enemies. Sister Amonarth did not feel pride – such selfish thoughts were beneath the devoted – and yet still she knew that this was a special day for her. She had served the Prophet faithfully through countless battles as one of the Faithful with squads of Speakers and Listeners, excelling in both melee and ranged combat and catching the eye of her superiors as one possibly worthy of donning the famous Crusader armoured Frame. To join the ranks of the Crusaders was one of the pinnacles of military achievement for the Children of the One True God, the ultimate reward for their battle-scarred veterans. Sister Amonarth had indeed proven her worthiness and was determined to repay the high-priest’s faith in her abilities at the next opportunity. First, though, it was time for her induction ceremony. As the music drifted out of the vast doorway, she began to clear her mind and shifted on her stocking feet, slightly cold in her basic underclothes. Then the colossal door opened, revealing the ranks of the Faithful lining the aisle down the centre of the temple, leading to her blessed armour. As the organ music swelled, she strode forwards with her head held high and the choir chanting the hymn of benediction. The chorus repeated its chant as she slotted the various armour pieces together, enclosing herself completely within the ornate Frame. When the final piece locked into place, the priest adorned her Frame with the heavy fabric garments that represent the Crusaders’ complete devotion to the One True God. She turned slowly to face the congregation, her mind familiarising itself with the neuro-command system that allowed the human controllers to steer the massive Frames. As the chanting came to its tremulous conclusion, Sister Amonarth lifted her Sword of Worship above her head, knowing that the next time she would wield the blade, it would be tearing through her enemies. Crusaders typify the military ethos of the Children of the One True God; steadfast in the face of the enemies of the Prophet with a fearless determination to bring them to the sword. They consist of experienced soldiers who have shown the skills and bravery needed to wield the medium Frames and heavy weaponry of the Crusaders wing. Their Frames consist of mechanically-controlled armour plating, pieced together in a way that enables unimpeded athletic movement and full body defensive coverage. It can absorb a great deal of punishment before the soldier inside comes to harm. A suited-up Crusader is a fearsome sight on the battlefield, around 7 feet tall and immensely broad and strong. Their huge Swords of Worship are far too heavy to be wielded by a normal human but the power of their Frames enables them to be employed with a lethal dexterity. While approaching their targets with a grim determination, the Crusaders close ranks in a highly effective defensive formation, laying down terrifying covering fire from in-built flechette launchers. What these weapons lack in accuracy they make up for with a terrible destructive power that can freeze enemies in their tracks, leaving those who survive the onslaught to face the mighty blades in close combat, where the Crusaders are brutally effective. The forward operating base was in disarray, the shell-shocked soldiers cowering in the rubble amongst the remains of their fallen comrades. Since the previous night, wave after wave of Cultists had been bombarding the small group of buildings that the Children of the One True God were occupying. The call had gone out to the main battalion for reinforcements but they were many hours away and, in the ensuing chaos, the Children’s front line had been reduced to a dozen remaining soldiers. As the massed ranks of Cultists prepared for yet another frenzied assault, the few remaining Faithful were beginning to question their orders from the Prophet, such was their fear of failure at the hands of the blasphemous horrors of the Cult of the Dragon. Their eyes, wide with panic, darted between each other and the roiling mass of Cultists only a few hundred feet away. One of them dropped his weapon and fell to his knees, arms outstretched towards the heavens, and he shouted a prayer to the One True God to send them some sign of hope. It was into this scene that Michael Abdul Shahid stepped, alongside an elite unit of Crusaders. A wave of optimism spread around the group at the appearance of one of the finest soldiers of the Children of the One True God. A few of the Faithful openly wept at this timely gift from the Holy One. Shahid stood at their centre, silently looking at each of them, one by one, saying nothing. He knew from experience that his presence alone was enough to rally the remaining troops and fill them with the strength of the Prophet. As they slowly got to their feet and turned to face the enemy, Shahid, still silent, strode to the front and raised his monumental blade above his head. He strode out towards the onrushing Cultists, flanked by his Crusaders and the newly invigorated ranks of the Faithful. His mind was perfectly calm and full only of thoughts of the divine righteousness of his mission as he cleaved through the torsos of the first wave of Cultists. 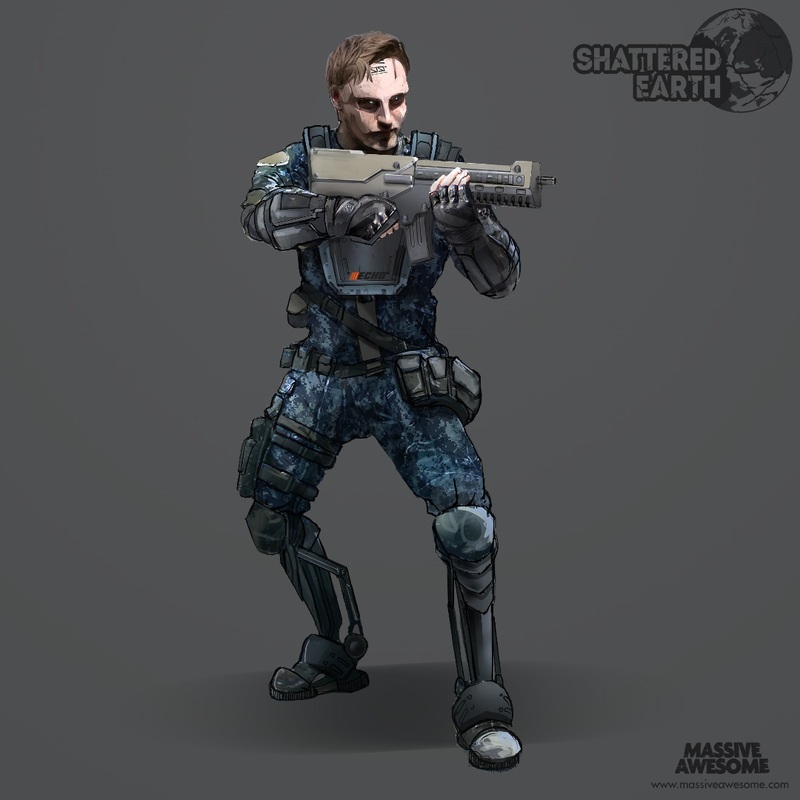 Michael Abdul Shahid is an elite soldier who commands a unit of his fellow Crusaders into battle in his specially adapted Frame, engineered to protect his vital organs that were traitorously wounded by a former UNM colleague before he saw the light and gave himself to the Prophet. Shahid’s legendary bravery over countless battles commands total loyalty from the units under his command, and gives him the appearance of total serenity, even when meting out violent retribution to the blasphemous. 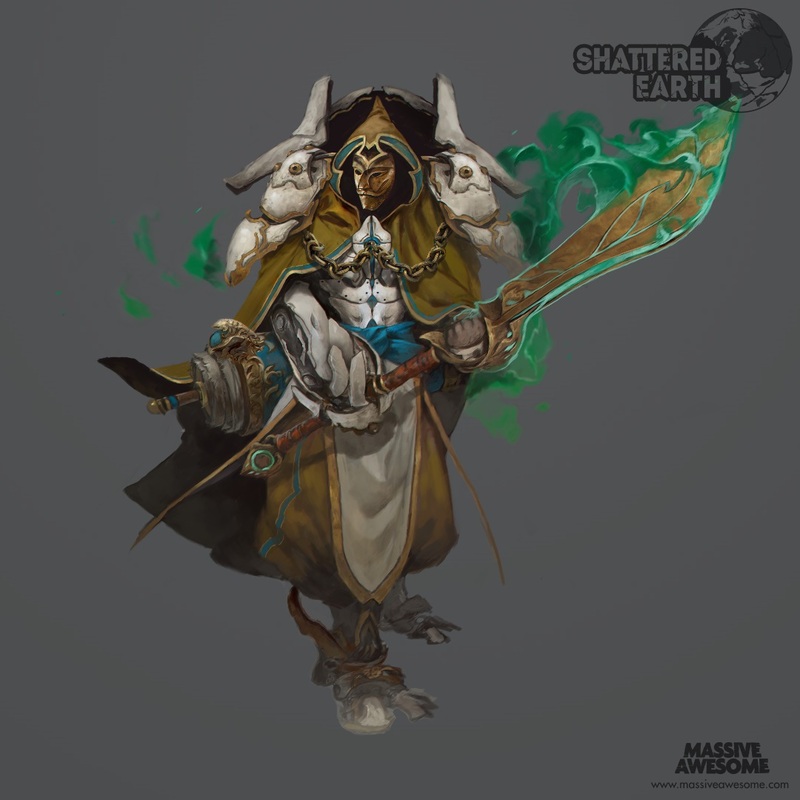 He declines to equip helmet armour to his Frame to better see both his brothers and sisters, and his enemies, faithfully relying on the protection of the Prophet. 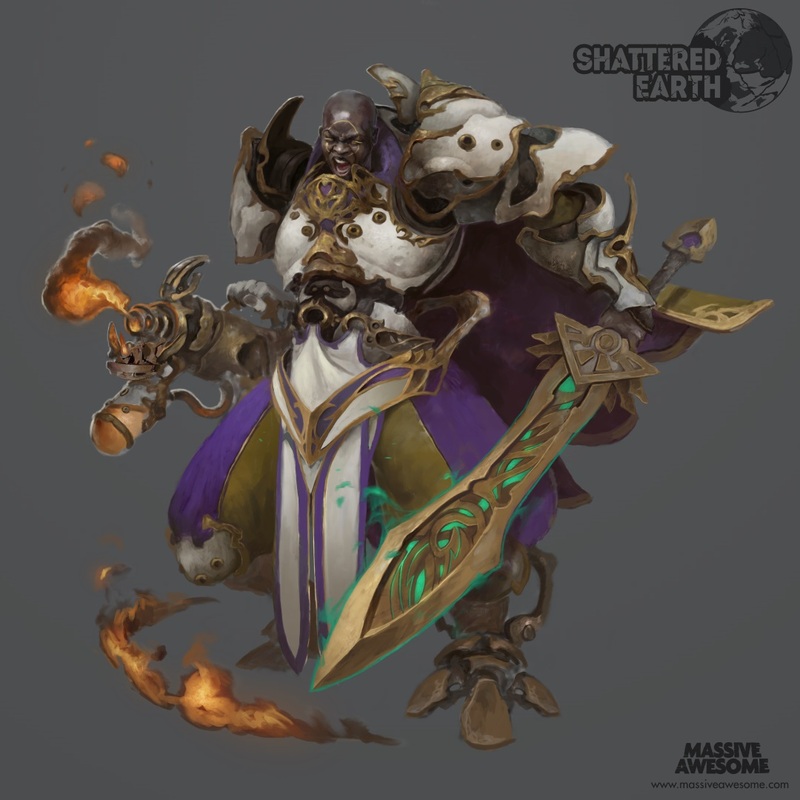 His many displays of bravery in the name of the Holy One are evidenced by the gold seals and purple sashes that adorn his Crusader armour and cloak. 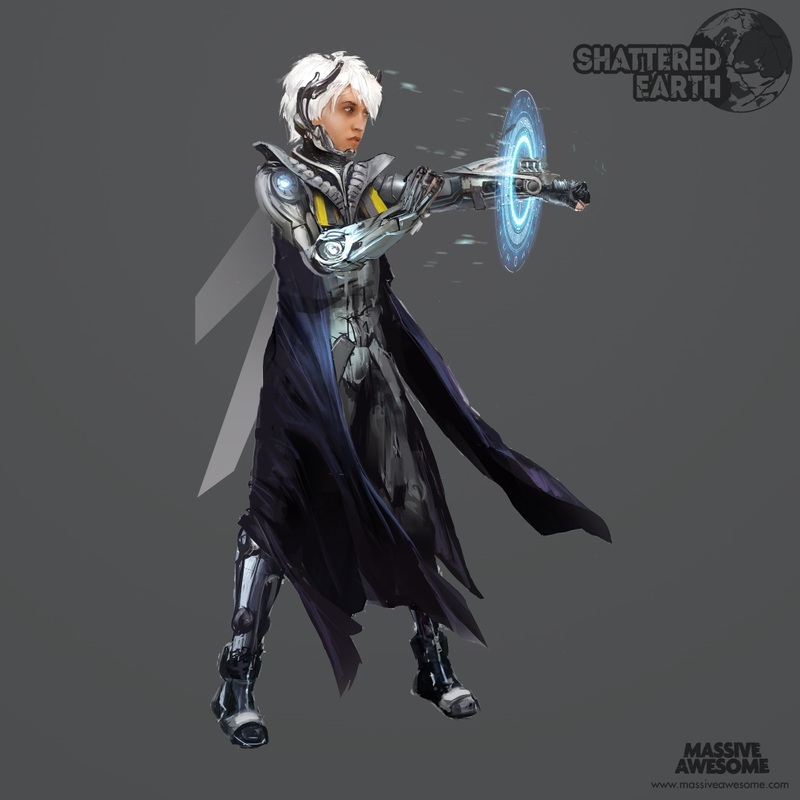 Shahid’s modified Crusader armour is equipped with a powerful heavy flamer, giving him moderate ranged capability and a useful crowd control tool. He also carries the legendary Sword of the Prophet, a weapon that radiates etheric power. He is able to decimate anyone or anything in close combat range with a combination of balletic swordsmanship and righteous fury. Doctor Tellason stood back and admired her work, her legs shaking slightly as the adrenaline started to wane and the tiredness began to wash over her. On the operating table was the unconscious body of perhaps the most important figure on the continent: Aurora. This was the seventeenth time that Tellason, the most gifted surgeon among the Humanist Rebellion ranks, had operated on Aurora and each successful procedure pushed her to the edge of her technical abilities. She stepped out of the theatre to rest for a few minutes before Aurora would wake and require debriefing. Usually, she would have hours between finishing surgery and the patient being conscious and coherent but Aurora was no ordinary human. As she opened her eyes, they darted straight for Dr Tellason. “Status?” she demanded, her tone cool and precise. “The procedure was a complete success” replied the surgeon, “The neural lash now has increased efficacy at longer distances”. “Clear the range so I can confirm for myself”. As Aurora strode into the basement weaponry facility, the few HR soldiers engaged in target practice stopped and stared at their most famous example, keen to witness the fruit of Doctor Tellason’s most recent labours. Aurora paused briefly at the first free space and focused briefly on the target, 30 meters to her left, before her arm sprang out and the strands of pure Etheric energy whipped towards and around the solid metal figure, instantly ripping the head from its body. The nearest soldier thought he saw the glimmer of a smile in her pale, crystalline eyes but, as she lowered her arm and the lash retracted, she left the range looking as cold and expressionless as usual, a striking juxtaposition of human and machine. Until the siege of Omsk in 12 A.E., Aurora was Najia Sahiri, a dedicated and valuable front line soldier for the European Socialist Collective (ESC) and then the Humanist Rebellion (HR). In that fateful battle, Najia lost her right arm and was subsequently offered an honourable discharge from the army. Rather than accepting this, she volunteered to be the first human subject to have a bio-mech limb replacement. Unlike the crude butchery of the Cult of the Dragon’s modifications, the HR had carefully developed advanced neural receiver hardware that enabled users to control bionic limbs as though they were their own. Over the following years, the HR used Najia to perfect the blossoming scientific discipline of cybernetics, testing each new advancement for effectiveness on the battlefield and, as she gradually became less human and more machine, she took the name Aurora. She is now the most advanced being on earth that is still ostensibly ‘human’. The questions around her powers and intelligence and whether she has become a mere human skin wrapped around an advanced Artificial Intelligence give her an air of mystery. She is aware of her own legend and does nothing to dispel the many stories she hears about herself – whether true or fantasy – to better keep her enemies guessing. Among the stories of her ‘magical’ powers whispered by her enemies there is a kernel of truth. Her Light Frame armour is connected directly to her brain via a neural interface and on top of the standard HR loadout, contains the addition of two powered glide unit ‘wings’ that she can extend from the back of her Frame and travel short distances through the air, swooping in on her enemies before tearing them down with the graphene shard projectors embedded in her wrists. These short range, rapid-firing weapons use mono-filament ammunition to shred anything close to her. To complement this she has an Etherically-powered neural lash which unleashes tendrils of incandescent energy, tearing apart heavy armour and organics with ease.